Royal Caribbean’s Symphony of the Seas is known as the largest cruise ship at sea. What this means is endless options for dining, entertainment, relaxation, and fun. With the constant go, go, go of a cruise ship with this many options, it is definitely important to slow down and take in as much as possible. Experience the ship the way you want and indulge in vacation amenities that will have you returning to normal life refreshed. Let’s take a deeper look at all that the Symphony of the Seas has to offer through a journey of our senses. There is no doubt that a ship of this size offers amazing dining options. With 7 complimentary dining experiences and 12 specialty restaurants you will in no way go hungry on this trip. 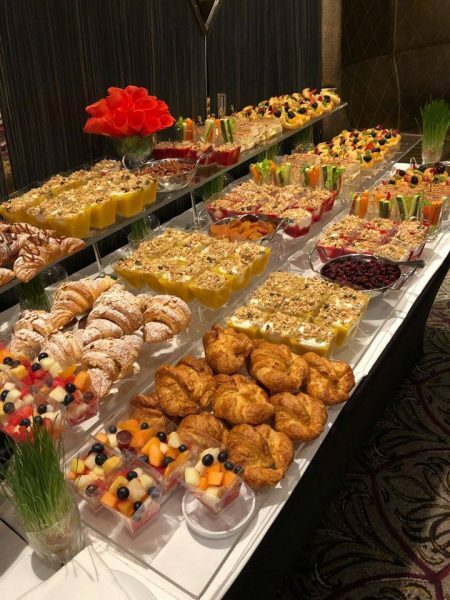 And let’s be honest, food is often one of the very best parts of traveling, so it is important that your vacation be full of delicious options. I had the pleasure of trying 150 Central Park, which offers high end dining cuisine and makes you feel like you are in the middle of New York City. If you want a little whimsy, then Wonderland is for you. And although the specialty restaurants offer delicious options, the complimentary experiences are a tasty treat as well. Stop by the Central Park Café for an unforgettable roast beef sandwich. Now when we talk about sights, there are really unlimited options for incredible views, shows, and more. But what really struck me on the Symphony of the Seas was the incredible art work. I spent an entire afternoon wandering the ship looking for different pieces, like I was wondering the halls of my favorite contemporary art museum. Symphony of the Seas is the biggest ship at sea, in more ways than one. 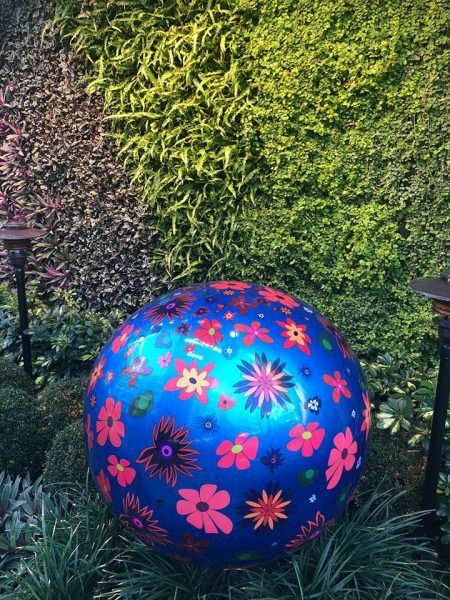 Its art collection is no different. She boasts an impressive 13,347-piece collection which follows the theme of, “The Wonder of Our World, a Journey into the Unimaginable”. Take your time and explore the different levels of the ship to hunt for your favorite artwork. 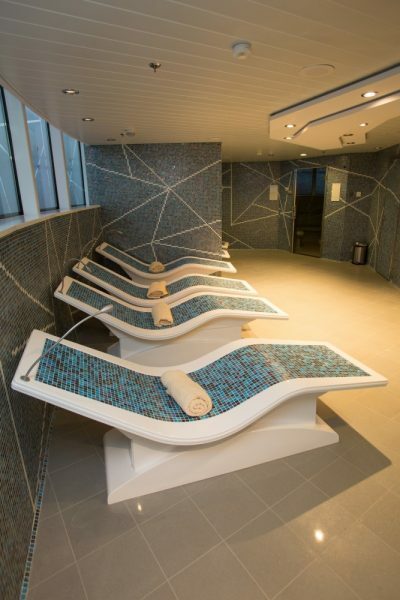 Hit your reset button with pure relaxation at the Spa onboard Symphony of the Seas. Whether you are looking for a massage, body wrap, facial treatment, or youthful rejuvenation, this world class spa at sea will leave you totally refreshed. With tailored treatments to the individual you are able to receive the exact type of service you are looking for. Recharge, relax, and rejuvenate in their state-of-the-art wellness facilities. Make sure to check out the seemingly endless options when you book your cruise, as they often sell out quickly. Walk the indoor/outdoor track and take in the fresh saltwater smells of the sea. Venture into the boardwalk and get whiffs of buttery popcorn, roasting hot dogs, and sugary sweets from Sugar Beach. Take a stroll through the Royal Promenade and smell test the designer perfumes and colognes at excitingly low prices. Plan a dinner at Hooked Seafood for New England style seafood and the delicious smells of the raw bar. Whatever types of food, drinks, and nostalgia you have you can find it onboard Symphony of the Seas. The sounds of the Symphony of the Seas are vast, but one that sticks out to me is the nightly musician located within Central Park, which in itself is a true treasure. For a ship that holds over 5,500 guests and 2,200 crew members, the quaint and quite Central Park is a tranquil escape. 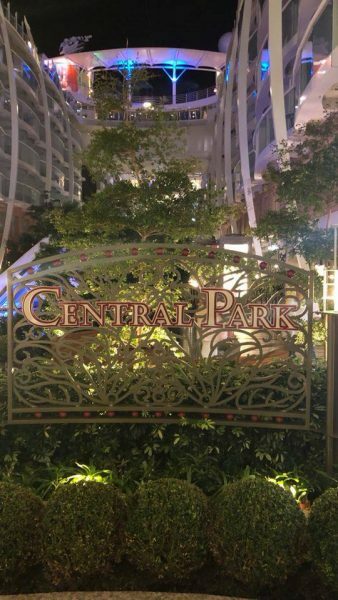 Relax in the evening on your Central Park balcony or sit within one of the gardens and take in the sounds of a relaxing guitar. Great for enjoying a post dinner cocktail or extending a romantic date night. 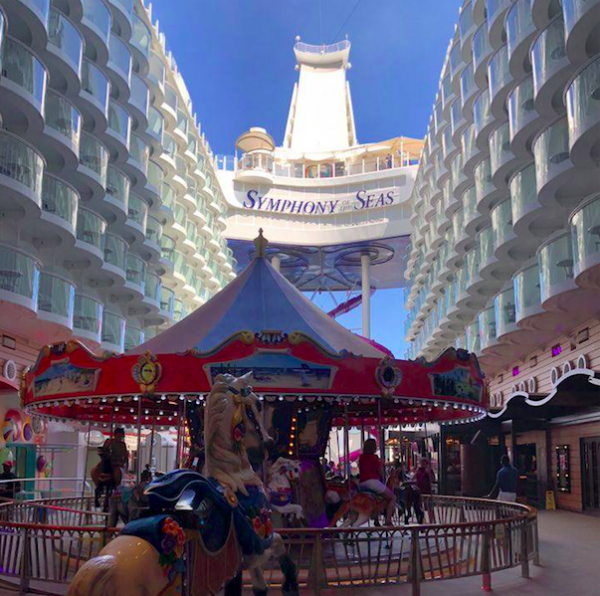 Symphony of the Seas is a true sensory experience. You are able to feel the rush of the wind as you drop 10 floors on the Abyss, taste the out of this world concoctions from the bionic bar, see world class divers plummet into a pool located on the edge of the ship, hear the laughter of families as they make memories, and smell the freshly groomed ice before taking in a show in the indoor ice arena. For an experience that will leave you in awe, the Symphony of the Seas delivers.